The movie lasts about two hours. But TJ Thickett arrived 16 hours early. 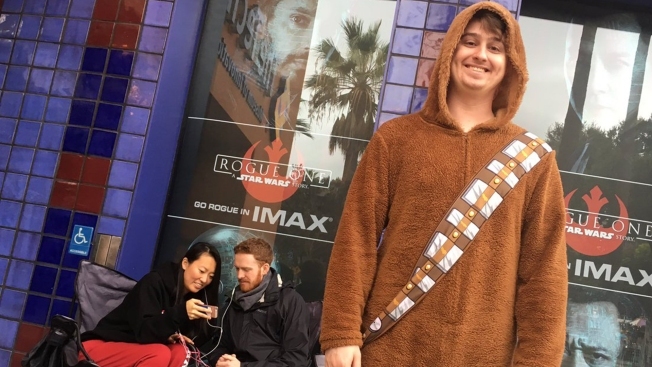 Thickett, determined to be the first in line to see “Rogue One,” is a huge self-described “Star Wars” fan, who even dresses for the occasion — in a Chewbacca onesie. “I’ve got comfy shoes, rebel alliance socks, and this onesie – the warmest, most comfy thing I own," he said. Not bad for a 6:15 a.m. arrival for a 10 p.m. movie. Neither dark clouds nor the Dark Side would stop the dozen people we found outside San Jose’s Tech Museum of Innovation. They came to see the movie in IMAX-domed greatness, and they came early. “Rogue One” is expected to do big business, and at least some fans will see it on a big screen. A good way to re-capture The Force.